Utranazz range of HM12H-E volumetric concrete mixers are the most simple to use and easy to maintain type available on the market. 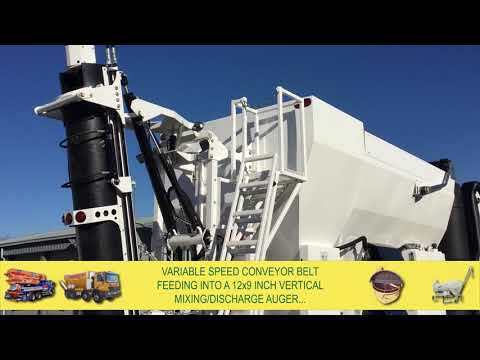 A volumetric mixer is essentially a mobile truck mixer and concrete batching plant rolled into one. All the raw materials are stored in separate compartments and these are then metered and mixed into fresh concrete when and where it is needed. This means there is no expensive waste of materials, as the unmixed product remains useable indefinitely. 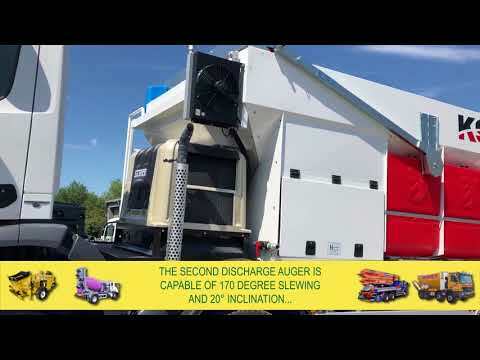 HM12H-E volumetric concrete mixer trucks have a patented removable cassette conveyor assembly, allowing the user to quickly and easily change the conveyor belt system by simply sliding out the old unit and sliding in the new. They are also fitted with a unique load-sensing variable displacement hydraulic system, which scales to higher and lower levels of output based on how much need is called for by the system. Therefore, if a part is not in use it will not be pressurised. This ensures wear parts will last twice as long. Utranazz volumetric concrete mixers are available with carrying capacities of 2 to 10 cubic meters*, they can supply concrete in volumes from as little as a barrow load up to impressive rates of 50m3 per hour. The HM12H-E can supply all mixes and grades of concrete, including screed and mortar. Mixes and grades can be switched from one customer to the next or even halfway through a job if necessary. They come equipped with many standard items that would only be supplied as optional extras with other volumetric concrete mixers. Items include: roll-over sheet, electronic measuring system, ticket printer, friction-less conveyor system, hydraulic chute control and wireless remote control.